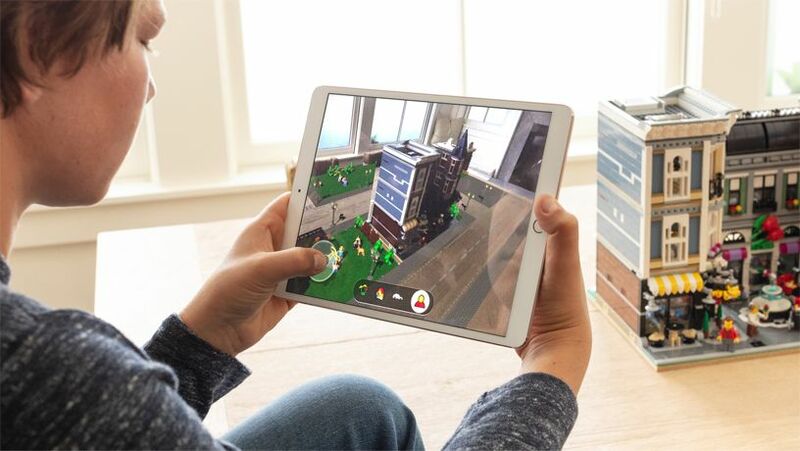 LEGO AR City uses ARKit 2 features including shared experiences, persistent AR and 3D object detection to bring LEGO creations and characters to life. Apple today introduced ARKit 2, a platform that allows developers to integrate shared experiences, persistent AR experiences tied to a specific location, object detection and image tracking to make AR apps even more dynamic. Apple is also unveiling the Measure app for iOS, which uses AR to quickly gauge the size of real-world objects, as well as a new open file format with iOS 12, usdz, which is designed to more deeply integrate AR throughout iOS and make AR objects available across the ecosystem of Apple apps. Apple has been delivering major AR advancements to developers at a rapid pace since ARKit shipped last fall, and this is already the third major release. ARKit gives developers the tools to create AR experiences that change the way iOS users see the world in both fun and productive ways. Developers can now integrate ARKit 2 features that allow multiple users to play a game. Shared experiences with ARKit 2 make AR even more engaging on iPhone and iPad, allowing multiple users to play a game or collaborate on projects like home renovations. Developers can also add a spectator mode, giving friends and family the best views of AR gameplay from a different iOS device. Persistent AR will also change the way consumers interact with AR apps by creating opportunities to leave virtual objects in the real world to which users can return. They can start a puzzle on a table and come back to it later in the same state or create an art project over the course of a few weeks without starting over each time. Shared experiences also allow users to watch all the action with a spectator mode, so you see what the players see and more. 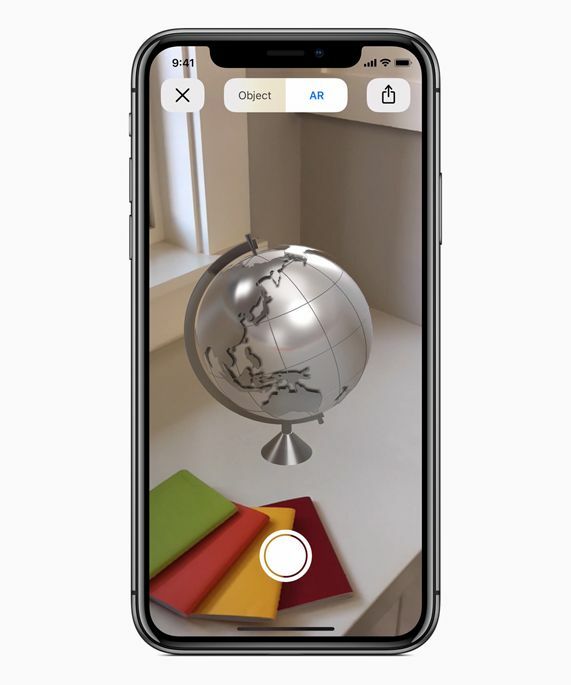 ARKit 2 also extends support for image detection and tracking, making it possible to detect 3D objects like toys or sculptures, and adds the ability to automatically apply reflections of the real world onto AR objects. This makes the AR experience an even more realistic mix of the virtual and real world. Measure is a new app in iOS 12, which uses AR to quickly gauge the size of real-world objects similar to a tape measure. The new app automatically provides the dimensions of objects like picture frames, posters and signs, and can also show diagonal measurements, compute area and allow users to take a photo and share it with accurate dimensions right from their iPhone or iPad. usdz is based on Pixar’s Universal Scene Description and makes it easy to experience AR nearly anywhere in iOS. iOS 12 makes it easy to experience AR nearly anywhere in iOS. In collaboration with Pixar, Apple is introducing a new open file format, usdz, which is optimized for sharing in apps like Messages, Safari, Mail, Files and News, while retaining powerful graphics and animation features. Using usdz, Quick Look for AR also allows users to place 3D objects into the real world to see how something would work in a space. ARKit 2 and usdz are part of the developer preview of iOS 12 that is available to Apple Developer Program members starting today. ARKit 2 and usdz support will be available this fall as part of a free software update for iPhone 6s and later, all iPad Pro models, iPad 5th generation and iPad 6th generation.